The price for the replacement of 2 belt material unit price , if you need replace 4 pcs seat belt , please choose quantity 2 . This is a high quality car seat belt webbing . There're 10 beautiful colors for your choose . Safe and fashion ,it's the best choice for super sports cars. 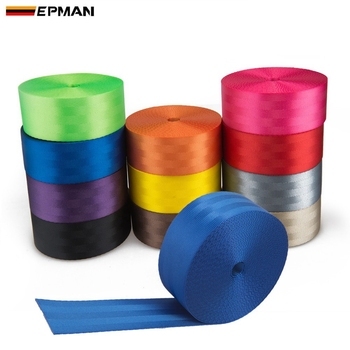 This polyester webbing is lighter in weight than regular polyester, but close in strength. Low stretch, low absorption rate, non-porous fiber, and high strength makes this an excellent choice for outdoor uses as well! Polyester is a strong and durable material for webbing. It is used to provide safety and resilience over other webbing materials. Country Brook Design Polyester Webbing is offered in a beautiful array of colors making it an attractive addition to any project. Polyester combines many of the benefits of both polypropylene and nylon without some of the negatives. It is best to use 2" hardware with this polyester webbing. D-rings, buckle, triglides etc. are sized by the webbing or straps they are meant to be used with. Although listed as 2", our webbing is woven to international standards between 47mm and 49mm wide. Tensile strength is the average breaking point under good conditions at the factory. We recommend that you use no more than 50% of the tensile strength of any webbing.